Yesterday, my daughters and I loaded up the van and left on a 2 hour drive to my hometown. While driving through a rural area, blue lights off in the distance caught my eye. I couldn’t see much, but I could tell that there were several cars with blue lights near an upcoming bridge. 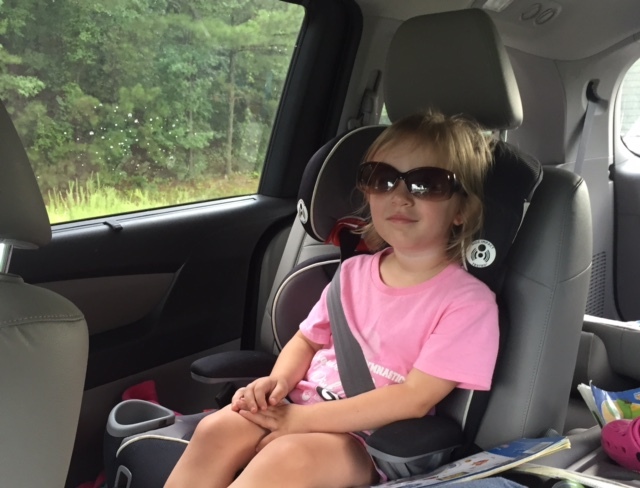 My 3 year was bored with the movie that was playing in the van so she noticed that I had slowed down and many other cars were suddenly around us. She was confused and started asking me questions. First, she wanted to know why all the cars were around us (since we live near Atlanta, we frequently have discussions about traffic). I told her that I thought there was an accident on the road ahead of us because I had seen blue lights. Confusion spread across her face. I asked if she knew what the blue lights were. She replied, “I dunno.” I explained that police officers have blue lights on their cars so I thought there might be an accident, and the police officers were trying to help. Then she started acting nervous and said that she didn’t want to see the blue lights…or go under the bridge. Two important things to note are 1) Delaney is extremely cautious in new or different situations and 2) there was no way that we could avoid the upcoming police cars or bridge. At this point, I had to change the conversation from giving her information to showing empathy and helping her deal with a stressful situation. I think it is important to label feelings as children experience them so that better connections can be made. Delaney is not very familiar with the word “nervous.” I explained to her that I understood that she was nervous and a little scared. I told her that seeing the blue lights was a good thing because that meant the police were helping. She was OK for a minute. Then she emphatically reminded me that she did not want to see the blue lights or go under the bridge. I made a suggestion. “You know what you can do? I will tell you when we are almost there, and then you can close your eyes so that you don’t have to see it.” She liked this idea. As we got closer, she started to panic a little so I needed a new strategy. “When it’s time to close your eyes, would you like to wear my sunglasses too? Do you think that would help you?” Luckily, she thought this was brilliant, and she put on my sunglasses. I think I handled a delicate situation as best as I could given the circumstances. Would you have done something differently? I’d love to hear any suggestions or feedback. Kids need a lot of delicate, sensitive handling. Kudos to you for dealing with her apprehension so well. Great job! Not only calming your daughter’s nerves but writing an amazing post! No problem! Good luck in blogging and maybe you will see my comments on more of your posts.